← Another new branch discovered on the Knapp family tree! The 72-year wait is almost over! According to ancestry.com, on April 1, 1940, there were just over 132 million people living in America. Today, about 87% of Americans can find a direct family link to one – or more – of them. 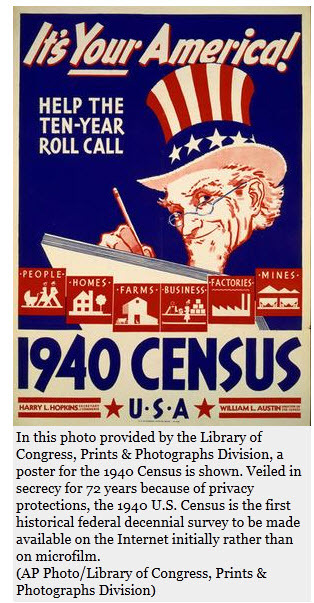 The 1940 U.S. Census will be opened to the public this April – providing genealogical researchers with a window into each of these 132 million-plus American lives. What type of information can you learn from the 1940 Census? The 1940 Census also provides clues to many unanswered questions to genealogy researchers who have “hit the wall” on finding a long lost ancestor.This decade was, for many American families, a time of great upheaval, financial hardship, physical separation and drastic change. After the Wall Street Crash of 1929, most of the decade was embroiled in The Great Depression, which had a devastating effect not just on Americans, but people all over the world. Families were separated while one (or both) parents searched for work in other cities or states. In some cases, the death of one or both parents resulted in children being cared for by relatives or placed in an orphanage. Family ties were often weakened or even broken by events and circumstances. During the Dust Bowl years, great numbers of farmers and ranchers left their homes in places like Oklahoma and relocated to California and other states. Great migrations of people were happening during this time period, as Oklahomans moved to California; southerners moved north to industrial cities like Pittsburgh, Cleveland and Chicago to find work in factories. In 1937, famed aviatrix Amelia Earhart disappeared while attempting to circumnavigate the globe. The search for what happened to her and her navigator has continued to this day. The 1930’s saw not only great financial turmoil, but also the rise of frightening political movements. The world watched in alarm as Adolph Hitler and the Nazi party came to power in Germany. Their fears were justified when,by the close of the decade in 1939, Hitler invaded Poland and began his quest to conquer the world. World War II had begun. For those of us born after 1940, the 1940 U.S. Census offers us a glimpse of what everyday life was like for our parents, grandparents and great-grandparents during the decade preceding America’s entry into WWII. Maybe a few of you lived through this decade yourself. If you did, I invite you to share a few of your memories with us. Please email KnappNotes@gmail.com and I will post them on the site. Or – please feel free to leave a comment on this posting. At midnight on April 2, the U.S. National Archives will provide the 1940 Census records to ancestry.com. At that time, ancestry.com personnel will start working to get each page posted online for researchers to use. I am looking forward to begin using it in my own research. It will be interesting to see what new connections and facts we can unearth as we eagerly scan its pages. To learn more about the 1940 Census visit: http://www.ancestry.com/1940-census. To view a blank copy of the 1940 Census form, click this link. By viewing this blank form, you can see what type of information is available on this census.